Warren Ellis has written numerous successful comics for each and every major publisher. It is safe to say that he’s one of the modern heavyweights of the trade. Fell: Feral City sees him writing a self-contained ongoing title for Image Comics. 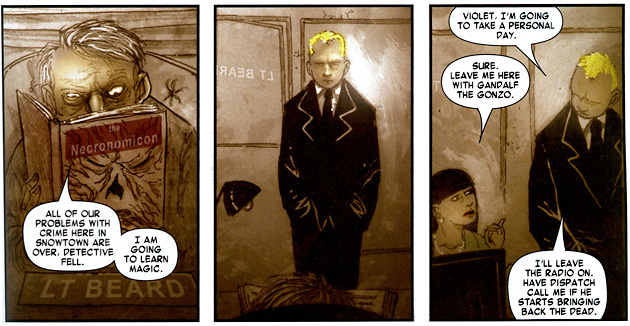 The beauty of Image Comics is that the creators get far more say in what they produce. This has led to the creation of some very different and interesting titles. 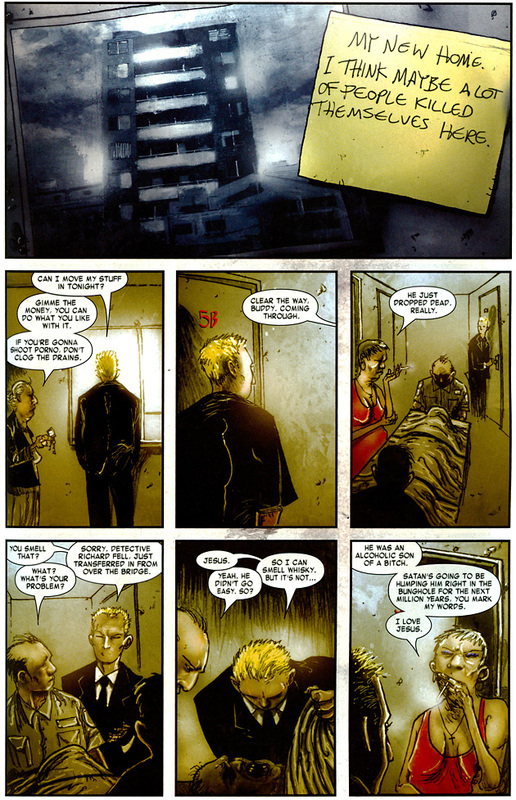 Fell was such a book, albeit a very small title – despite being classed as an ongoing, the publication had been sporadic at best, with gaps of up to 10 months between issues being released. To add to this, the writer’s computer died in 2008. It contained several scripts for Fell that were never re-written, leading to nothing being published since issue 9 back in Jan ’08. Over the past two years there has been gossip about the title coming back sometime soon. 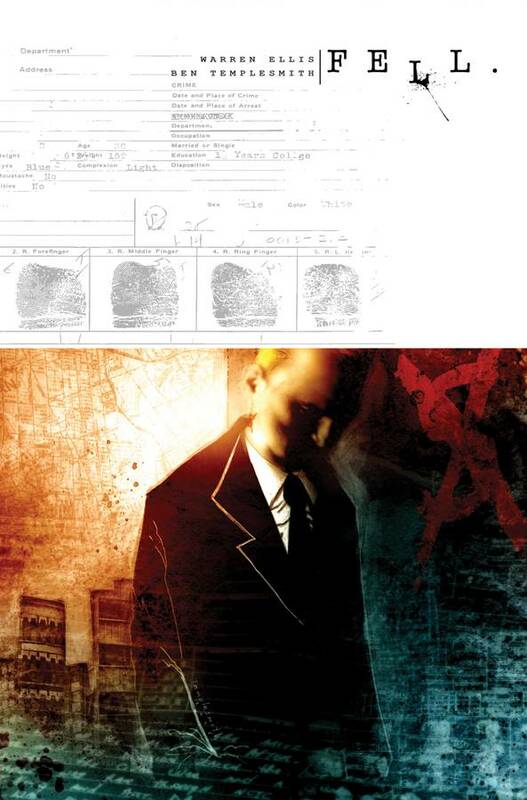 Recently, it seems that the rumours are close to becoming fact rather than fiction, with Warren posting on his twitter that the script for #10 has been sent to the artist Ben Templesmith for production. Fell follows the character Detective Richard Fell during his exile from “the city over the bridge.” He is forced into the move following some unknown, often hinted at, incident. The city he is sent to, Snowtown, is an urban wasteland that appears to have been in decay for the best part of 20 years. It is a city rife with low-life and crime. It isn’t a place filled with moral people. As the title indicates – a feral city. It is Fell’s job, as a detective, to try and impose some form of law on this desolate slum. He has some help, but it isn’t much – his addition Snowtown’s police department takes the number of detectives in the city up to four. Well, four and a half. As the chief reminds near the start of each issue, that final officer doesn’t have working legs. We get to follow Detective Fell through several differing stories that make up his day to day life in this new city. Every story contains something that shows the depravity of Snowtown. We have wine enemas for an alcoholic, the murder of a young pregnant lady, a white middle-aged suicide bomber and many other immoral focus points throughout the volume. Those of you who are familiar with Ben Templesmith’s work will know how hazy and dark his art can be. It can add to the grim feel of a story, like in the 30 Days of Night series. I was a big fan of his artwork in that particular title, where it was a huge factor in the book’s success. 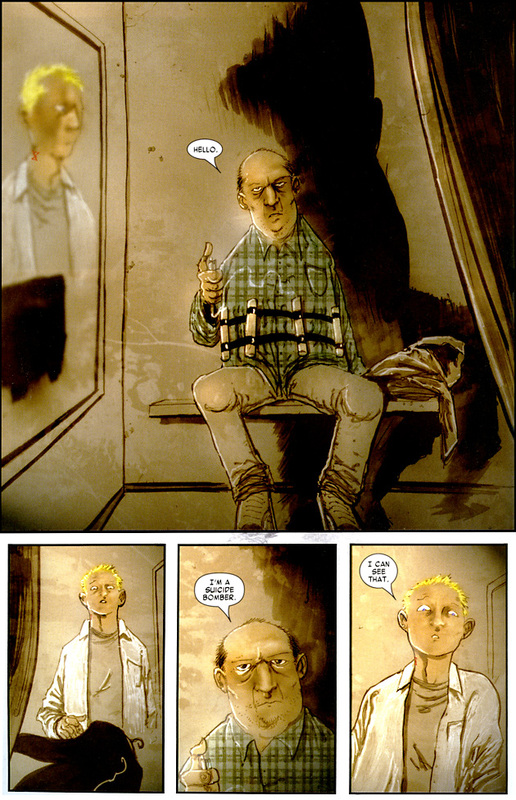 In Fell, Templesmith expresses that inner darkness in normal people, rather than vampires, and he pulls it off in each and every panel. He lets you see through the eyes of a particularly morbid detective; I look at every person wondering what their secrets are, waiting for their dark deeds to become apparent. The best example of this is a nun who wears a Nixon mask, a memorable recurring character even without a single spoken line. While she (or he, perhaps) never becomes more than a background presence, in almost every issue the nun is there, looming like some dark unknown force. I cannot wait until that enigma is explained. 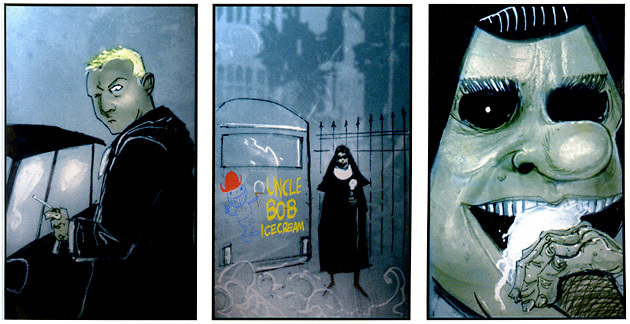 Even without explanation, though, the nun lends creepy flavor to Snowtown’s streets. The original printing of this comic was a little experimental, as each issue was only around 15 pages in length. The intention was to create a more affordable comic, by losing pages, without losing content. To compensate for the page loss, almost every one is split into a grid of 9 panels. This conscious decision to push a high panel count worked, I am happy to report, because the loss of length is barely noticeable. In trade, it’s hardly noticeable. One other positive is that the deviations for splash pages or important action panels, which only take up to 6 panels worth of room, have a greater effect on the reader. One of my major gripes has been the overuse of splash pages in mainstream books, usually averaging 4 or 5 in a 21 page issue. That’s roughly a quarter of the comic! So apparently, a fourth of the modern comic book is meant to be shocking or dramatically important. For me this is far too often, similar to TV shows that have cliffhangers for every commercial breaks. The dramatic tension, instead of being maintained, is diluted through overuse of these obvious hooks – they become tired. Thankfully, Fell rarely has more than one splash per issue, some even have none. When there is a splash it still has an effect. I found this very refreshing and more enjoyable to read. While dark, the book isn’t all doom and gloom; there are some light and touching scenes with Rich and Mayko, a young Vietnamese woman who owns a bar in the city. There are a few other fun characters such as the detective with no legs and the chief of police’s secretary; the later having some humorous (and classically Ellis-style discomforting) dialogue with Rich about her husband leaving her for the dog. On the whole, this is Ellis at his very best. Borderline offensive (in that fun way) without too many swears or British-isms, avoiding sounding like he just came off some bender in London. Not too silly, but still funny. Disturbing and sinister. Templesmith’s artwork is his best to date, in my opinion. My main reservation with the title is the lack of a second trade – there’s no satisfying conclusion or evolution of all of the ongoing plot seeds. I have some worries about issue number ten as it will be over two years between issues. But these aren’t actual problems with this book – if anything, it’s just an indicator that Fell: Feral City has got me hooked. I can assure you that the 8 issues collected here are top notch stuff – in fact they have won two Eisner awards, for best new series and best continuing series. We can only hope that “continuing” er, continues, with Fell becoming a real ongoing title again. Maybe in the next few months! 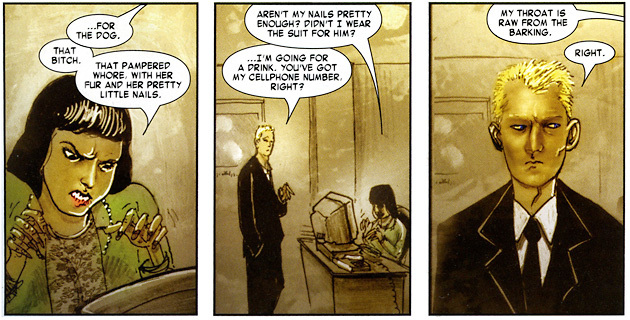 Personally, I would rate this above Transmetropolitan for Ellis and way above any of Templesmith’s other works. The only thing that lets it down is the current lack of volume 2. Entirely self-contained, so 100% essential. This is the beginning of this ”ongoing” title, so jump straight in here. The only title that feels remotely similar to read, that I can think of, is 30 Days of Night: Bloodsucker Tales (specifically the Juarez storyline). 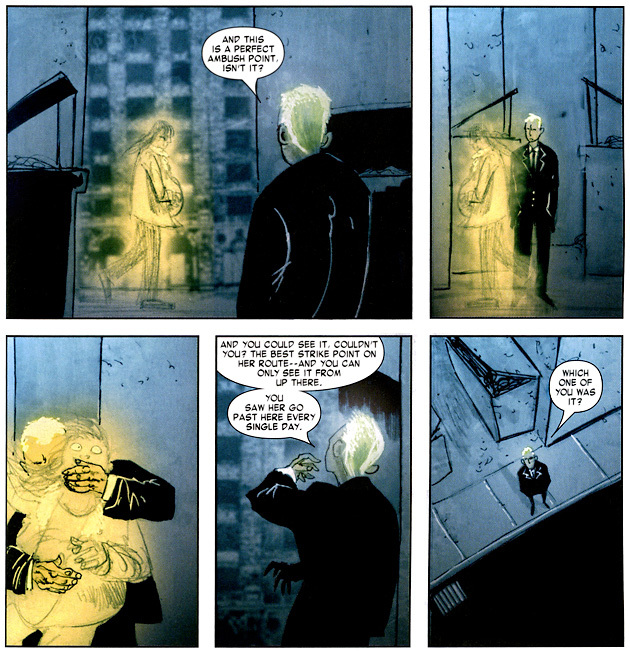 If you need more Ellis now, you should probably read Transmetropolitan if you haven’t already – but it doesn’t have the same noir vibe as Fell. This was a great review with great page excerpts. The pages shown really seem to display what this book is all about and takes my interest to a 10/10. Sad to hear about such a huge delay. I guess Ellis should learn how to backup his computer. The question that really looms in my head however is…what are they clogging the drains with?!?! hopefully it does! Maybe your review will help. Getting it in my inbox certainly encouraged me to finally go read the trade, which had been in my “get to” pile for about a year and a half. You should email me a list of your get to pile, I could review some stuff from it if I have them; you always say you like to read things without worrying about having to review them. That’s nice of you. I actually kind of like it being a surprise, though. I tend to make up weird systems to decide what I’m going to read or review next, and it’s fun to just have some randomness (from my perception anyway) thrown in there. You’re a sick sick man. Ha! Nice. I’ll make sure to use that excuse when my wife gives me a hard time. In that respect, I’m very lucky that my fiancee is also a visual artist interested in comicbooks. And that she sees this website as a valuable use of my time – which it is, I get a lot of writing practice which could someday help support us, which would be nice. hehe I knew you weren’t being serious. Of course, my being fairly obsessive an a bit of a workaholic comes in handy sometimes. may be another sign of cheating.